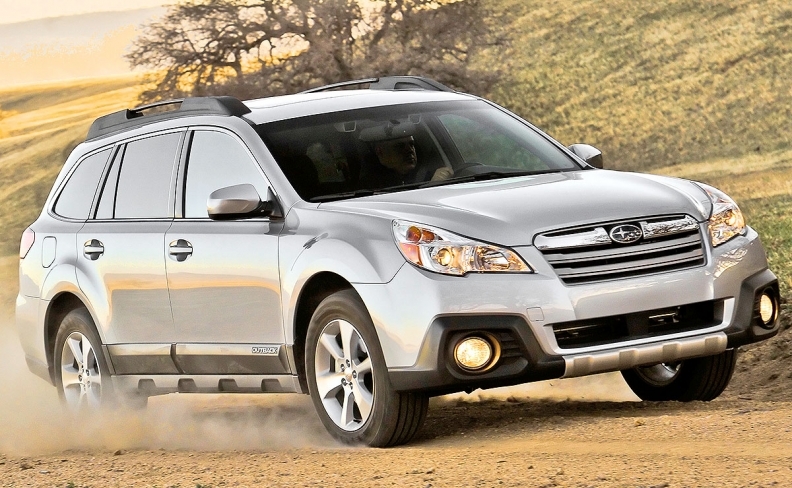 Subaru is recalling certain 2010-14 Legacy and Outback models equipped only with a manual transmission for a potentially faulty electronic parking brake. The recall covers 30,661 vehicles in Canada and the United States, including 7,994 Legacy sedans and 19,181 Outback crossovers in the United States. The automaker didn't break down the 3,486 affected vehicles in Canada. According to a safety recall report posted on the National Highway Traffic Safety Administration's website, a capacitor on the circuit board and/or the actuator stroke sensor magnetic ring, which is in the control unit of the electronic parking brake, may crack over time. If either component cracks, the brake warning lamp lights up, but the parking brake may not engage. If the transmission "is not in the recommended gear when the vehicle is parked and the emergency brake does not engage, the vehicle could roll away," the report says. The recall covers Legacy models built between Dec. 10, 2008, and May 19, 2014, and Outback models produced between March 16, 2009, and June 2, 2014. Both models are manufactured at Subaru's Indiana plant. Continental is the component supplier, the safety report indicates. Subaru will notify owners, and dealers will replace the electronic parking brake actuator assembly, free of charge. The recall is expected to begin Nov. 7.